Agra is usually under the radar of the first-time traveller if not for its timeless tale of a Shah who built a bejewelled mausoleum to honor the memory of his wife, an architectural statement that has become the crown jewel of India. 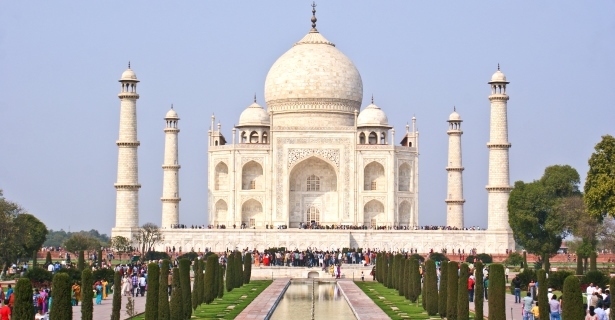 Finding a place where to stay in Agra to behold the Taj Mahal is easy; there are plenty of budget hotels in Agra, India. The challenge is to keep your equanimity amidst the ocean of eager tourists who want to have their moment in one of the most beautiful architectural achievements of the world. The Taj Mahal Agra is, quite literally, “the jewel of Muslim art in India and one of the universally admired masterpieces of the world’s heritage.” The scale of its grandiosity – imagine a translucent marble mausoleum inlaid with jasper, jade, turquoise, lapis lazuli and sapphire – takes some time to digest, and the construction itself was said to have cost the Mughal Empire dearly that its completion marked the beginning of the empire’s decline. To keep within striking distance before the swarm of wide-eyed tourists closes in, stay in the best hotels in Agra and wake up to a panoramic view of the Taj. Top hotels and resorts in Agra, India are surprisingly well priced. While Taj Mahal Agra should be the first on your list without excuse, it is by no means the only jewel in Agra’s treasure chest. Though eclipsed by majestic Taj, several other historic mausoleums that have become the resting place of Mughal emperors dot the otherwise industrial Agra landscape. Look for the red-ochre sandstone Sikandra which houses the remains of Akbar the Great, and Itmad-Ud-Daulah, known as the Baby Taj, which is the resting place of Empress Nur Jehan’s family. Get to know better the once prosperous capital of the Mughal Empire. There’s a generous helping of comfortable and strategically located 3 star hotels in Agra so you need not rough it in a city swarming with touts and occasionally smothered in smog. Of course, if you want to save more, a handful of hostels in Agra have modestly furnished rooms. Opposite the gleaming white marble of Taj Mahal is the red sandstone Agra Fort where the scheming Aurangzeb confined his father Shah Jahan until the latter’s death. Then there’s the 16th century UNESCO World Heritage Site in Fatehpur Sikri and its palace complex, once a short-lived capital of the Mughal Empire. Devoted Hindus do not pass up on paying homage to Krishna in his birth place in Mathura. As befitting the place of origin of a major Hindu deity, Mathura is dotted with temples all throughout. All this moving about makes one hungry, and if you can’t grab a full meal on the go, try chaat. This is a savoury snack typically sold out of roadside food carts and stalls. There’s also petha, a type of sweet candy, and Dal Moth, a spicy lentil mix to introduce you to Agra cuisine. Should you pine for Korean food or a reggae ambiance, the city’s bars and restaurants will both surprise and delight.